Select the Show icon in notification area check box to enable the display of the Updater icon in the taskbar notification area. The context menu of the icon allows you to access the settings and view information about the version of the Updater. Select the Update virus databases only check box to download updates of the virus databases only. 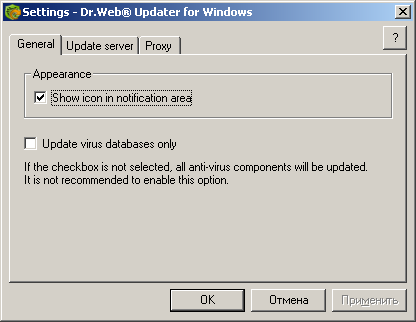 By default, components of Dr.Web Anti-virus are updated together with the virus databases.